Five companies. One remarkable vision. When Sanders Lee came to Canada in 1991, he envisioned a group of companies that would lead their industries and be respected throughout the business world. He wanted his to be a company in which people shared a set of common values - dedication and passion, leadership, respect, innovation, shared success, accountability and teamwork. This philosophy has taken hold across the entire group of companies and drives our corporate success. From our warehouses in Brampton to Hopewell’s head office in Calgary, our employees celebrate teamwork and together, strive to conquer new challenges. As a result, our business gains energy, and our people are empowered to care more, learn more and succeed more – proving that together we are, in fact, achieving the impossible. Hopewell Residential consistently innovates, designs and constructs outstanding, award-winning residential neighbourhoods, multi-family developments and single-family homes that are distinct from all others. Hopewell Development plans and builds state-of-the-art industrial, retail and suburban office spaces. The Corporation’s developments in Western Canada and the Greater Toronto Area have allowed it to become one of the largest commercial developers in Canada. Hopewell Real Estate Services is a full service third-party commercial property management company that manages over four million square feet of industrial, suburban office and retail properties for private investors, pension funds and publicly traded companies. Hopewell Capital provides strategic planning for the Hopewell Group of Companies, and also maintains an investment arm that analyzes opportunities within real estate, private equity and public markets. Hopewell Logistics is a leader in combining technological advances in logistics with state-of-the-art distribution facilities in Calgary, Vancouver, and the Greater Toronto Area, serving a long list of manufacturers and distributors. At Hopewell, we reach higher and achieve more, not only because we do our best each day, but also, because we believe in our vision for the future. Our employees are dedicated and passionate about their work, and about giving back to the community. Because of our team’s skill and dedication, our companies consistently produce remarkable results. 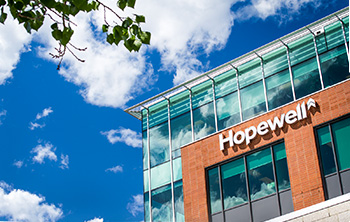 Hopewell’s team includes over 300 employees in Calgary, Edmonton, Winnipeg, Brampton, Toronto and Vancouver. Our employees have a rich and varied history with expertise and training in the areas of construction, engineering, business, urban planning, law, finance, accounting, architectural design, landscape architecture, management information services, computer graphics and estimating, among a great many other areas of expert knowledge. We are proud to have numerous long-serving employees, including several who have worked for Hopewell since our inception in 1991, as they are a testament to the enduring strengths and positivity of our corporate culture.